Professional and college reporters training collaboratively for the future of Bay Area journalism. Bay News Rising hopes to organize student journalists in the recognition of a growing need for trained coverage of social justice and labor movements — and to also provide a source of ongoing training, networking, mentoring and publishing for student journalists collaborating for the future of Bay Area journalism. Students will be encouraged to practice coverage of labor unions, workers, immigrant and women’s rights in the broader context of social justice in the Bay Area. There will be opportunities for breaking, investigative and feature style news under this umbrella, as well as many opportunities to practice multimedia and social media journalism. Students will be taught that their reporting is worth something — we show them how to get paid for their journalism, and to market themselves to news organizations in and around San Francisco. Bay News Rising is a project of the Pacific Media Workers Guild made possible by funding from the Communications Workers of America and the Berger-Marks Foundation. Click here for the application. Pacific Media Workers Guild Executive Officer Carl T. Hall addresses journalism students, asking them to think critically about the news value of a recent Chronicle story on Sonoma vineyards. Photo by Luke Thomas. Bill Snyder, Guild Freelancer unit chair, is the editor-in-chief of the Bay News Rising student news staff. Carl T. Hall, Executive Officer of Pacific Media Workers Guild serves as adviser for the program. Kat Anderson is the project director, a labor and employment attorney who graduated from Stanford and University of California Hastings College of Law. Ms. Anderson founded Bay News Rising. We will have journalism students/recent grads as assistants to the program manning the web production and other operations. Student journalists from Bay Area journalism schools, City College of San Francisco and San Francisco State University, will cover at least two stories in the six week summer program. The program is tiered so that more advanced students can opt to cover more in-depth projects as well, pushing past the initial assignments. In keeping with the Pacific Media Workers Guild’s belief in fairness to freelancers, students will be paid for the work they produce. The students are also paired with mentors at the outset of the summer, in order to further learn the tricks of the trade. 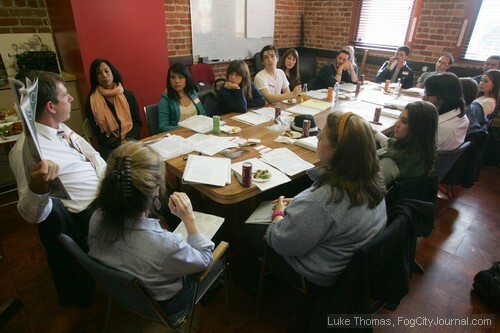 Many journalists from across California have signed on as mentors.